Spring has sprung, or at least inside my home it has! I do live in the Sunshine State however, this past weekend as soon as I started putting my spring vignette together we had a real feel temperature of 39 and getting as low as 29 in the morning! So even though the outside did not feel like spring my home is beginning to bloom with some really pretty things! Pretty much each piece on this table I am in love with. 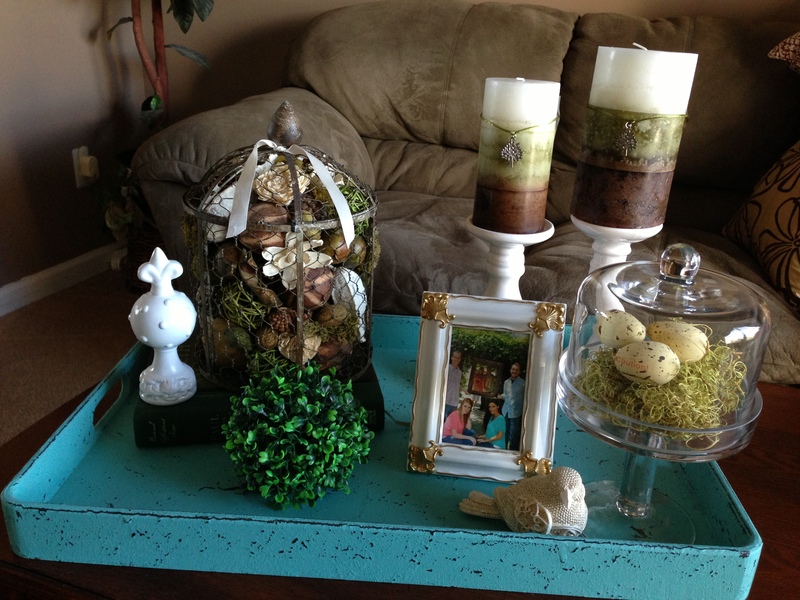 I did go out and buy some new items at Hobby Lobby since I have never done a spring vignette before. I can tell you Hobby Lobby never ever disappoints me. I had started my table on Friday Night (while hubby was working at the Home and Patio Show) only to find there was something missing. So the next morning (braving the cold mind you) I headed to the store and found this awesome gate attached to the half painted planks! I was in instant love. I could hardly get my glasses out fast enough to find the price! On sale – a score for me! These flowers were from Target, the Spring blocks Hobby Lobby and the cute bird was actually the top of a jar I found at Pier 1 Imports I just took it off and viola an instant complete look! 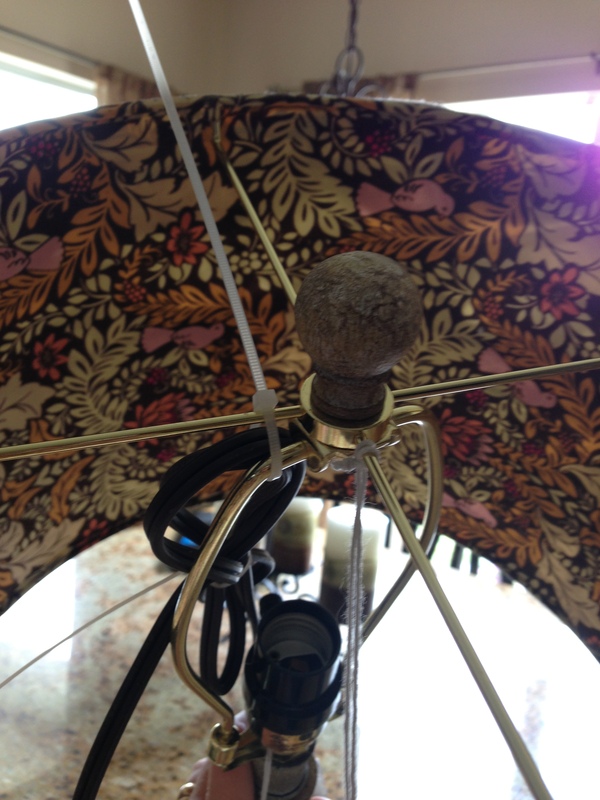 I showed you a sneak peek of this lamp in last weeks post of My Secret Obsession but today I want you to see the inside of it! Not only do I love the burlap “lace” around the outside for this table, but the inside is flowers and birds! How cute is that!? I got this beauty on clearance at Burlington Coat Factory and let’s just say I was really almost stealing it from them it was so inexpensive! Then I leave you with another little inspiration of spring I did. This one was done by running all over my home to find things in my craft room and my bedroom to create this sweet little piece. I sure hope you are feeling spring inspired. I would love to hear your comments and even see what you are up to. If you have not liked my Facebook Fanpage hop on over and do so now. I post other bloggers give-a-ways and some of the other ideas I find on other blogs. I just may add yours as well so tell me about it over there! 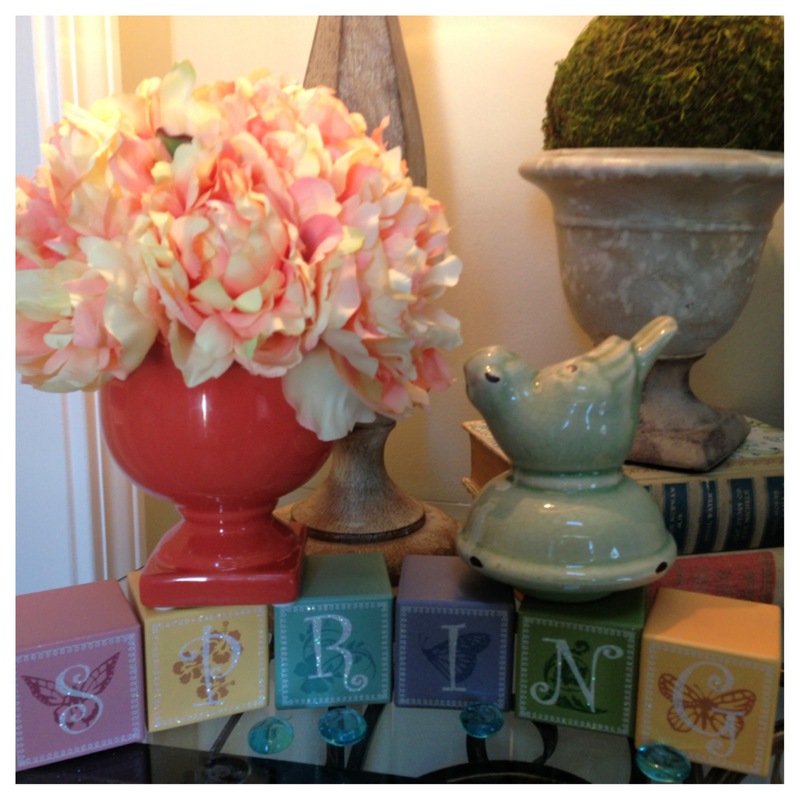 I love your spring vignettes! I saw something similar at Hobby Lobby with the weathered wood and wanted it so bad. I just didn’t know where it would work for me so I had to pass it up. I like all your accents. I used a lid top to a jar for a setting in a terrarium. They make cute accents! 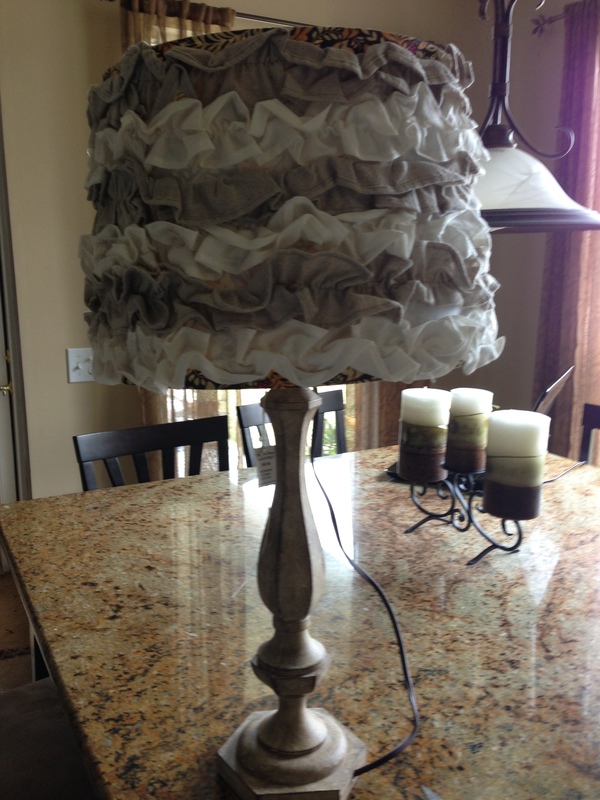 Your lamp is too cute! I’ve only been to Burlington a couple of times but they really do have some great prices. 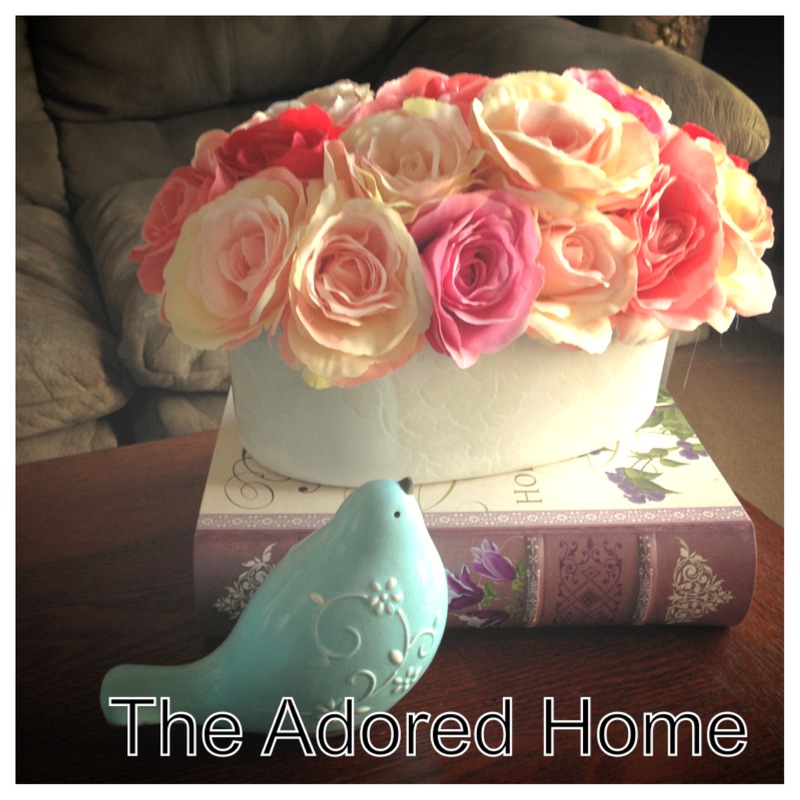 Your rose arrangement on the book with the bird is so cute! 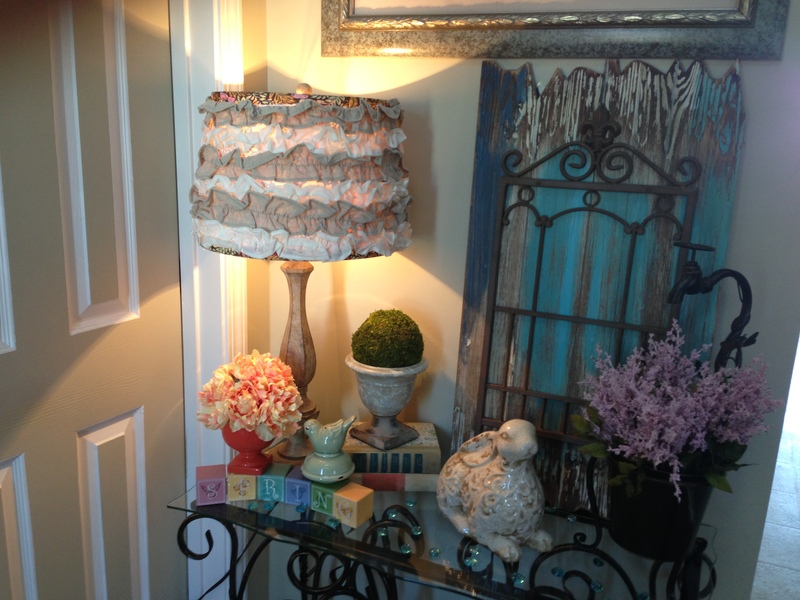 I need to focus on some spring decorating here…I’d just like to not see snow outside when I do! Thanks for stopping by! I did find the wood piece at Hobby Lobby and was so excited when I found it! Even on sale!!! Have a great day! HI Sandra, love your vignette. So pretty with the weathered wood. I love that tray on your coffee table. It is soo pretty and will be wonderful to decorate for the seasons. 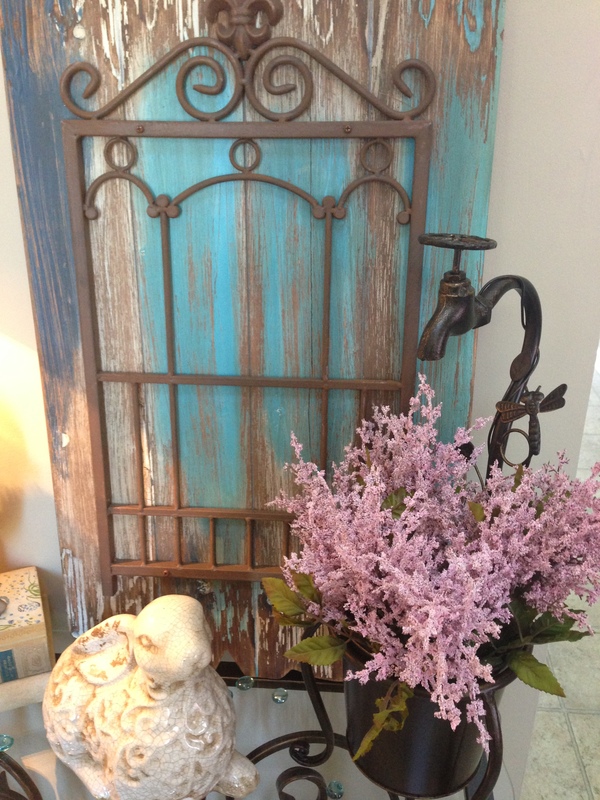 Thanks Debbie, I searched for the perfect piece and when I found that weathered wood I knew it would be it! The tray fell into my lap really and I agree it will be good for all seasons, I’m already thinking about Summer! Thanks for stopping by! Love that little blue bird and the coffee table tray! The nest in the cake stand is absolutely adorable! *Over from the link up! Nicky, thanks so much for stopping by. Glad to meet people from the link up! I’m headed over to see you now! Thanks for stopping by, I enjoy meeting others from the link up parties! Happy Spring! Sandra it is a lovely way to celebrate spring!Thank you for sharing at the hop, your participation makes the hop extra special. Big Hugs P.S. the new giveaway posted Friday! I enjoyed meeting new people! I will be there on Friday! Have a great week!